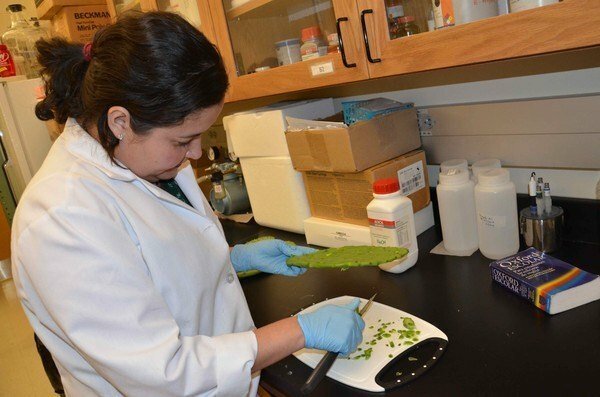 (Click to enlarge) USF PhD researcher Daniela Stebbins prepares a pad of prickly pear cactus for processing into mucilage in an experimental project to develop a new, non-toxic oil dispersant. Credit Katy Hennig/University of South Florida . Associate professor of chemical engineering Norma Alcantar is filing for an international patent for a cactus mucilage as an oil dispersant. (From the University of South Florida) — A University of South Florida engineering professor and a team of researchers have found that mucilage from the common and easily grown prickly pear cactus – already known to clean toxic compounds from drinking water – also works as a natural, non-toxic dispersant for oil spills. Mucilage is the thick, glue-like substance from the plant. In research stemming from the 2010 Deepwater Horizon disaster, Norma Alcantar, an associate professor of chemical engineering, said a powdered form of the cactus mucilage absorbs the oil and breaks it into smaller droplets, allowing the oil to degrade faster. Alcantar and the research group have spent nearly two years investigating the use of the cactus mucilage and is part of a nationwide project looking for natural alternatives to harsh chemical dispersants. The April 20, 2010 collapse of BP’s Deepwater Horizon offshore drilling rig in the Gulf of Mexico created one of the nation’s largest and costliest natural disasters. The use of the chemical dispersant Corexit to combat the spill remains one of the most controversial and studied events of the disaster, with scientists examining long-term effects from the dispersant in the Gulf environment. With initial funding from the National Science Foundation, Alcantar is working with the Consortium for the Molecular Engineering of Dispersants Systems (C-MEDS), a nationwide group of scientists funded through the Gulf of Mexico Research Initiative, who are focusing on finding effective alternatives to chemical dispersants. Alcantar is joined by USF Assistant Professor of Chemical and Biomedical Engineering Ryan Toomey and researchers Dawn Fox, Maria Celis, and Daniela Stebbins in the project. Unlike chemical dispersants, the cactus mucilage is not toxic and is harmless in an ocean environment, Alcantar said. In the plant, mucilage helps hold water in the cactus leaves but can be extracted from the leaves through simple processing. The leaves themselves are consumed as a vegetable throughout Latin America. The mucilage in Opuntia ficus-indica – more commonly known as the Nopal or prickly pear cactus – is a gum-like substance derived from the paddle-shaped leaves of the plant. The thick mucilage is extruded from the plant, dried and ground into a powder that when applied to the oil binds to oil molecules. In lab experiments in which the mucilage powder is applied to crude oil similar to what spilled in the BP disaster, the mucilage is able to disperse the oil film as well as absorb it. In bodies of water such as the Gulf of Mexico, the oil droplets bound by the mucilage can be biodegraded by microbes. Lab results show that that dispersant particle size and distribution can be affected by the salt concentration of the water, but the mucilage is effective under salt concentrations similar to the ocean, Alcantar said. Alcantar said more research is needed to determine how the mucilage powder can be used on larger slicks and in realistic ocean conditions, but she is confident enough in her discovery to file for an international patent for the cactus mucilage as a oil dispersant. Alcantar holds a 2011U.S. patent on mucilage for water purification uses. Producing the mucilage powder won’t present any hurdles, Alcantar said. The plant is pervasive throughout the Western Hemisphere and is easily found worldwide. The plant is easy to grow; producing three cycles of new leaves in a year and requiring little water. Having learned of its use to clean contaminated water from her grandmother in Mexico, Alcantar began to investigate eight years ago whether there was science behind the home remedy that had been handed down for generations. There was. She discovered that by peeling, chopping and boiling the cactus pad, the thick, gummy mucilage would be expelled from the plant and bind with the contaminants in the water, including bacteria, heavy metals and arsenic. Her discovery made international headlines as a low-cost, sustainable measure that could be used to address the clean water crisis in impoverished countries. To view Alcantar’s patent application through the World Intellectual Property Organization, click here.